May 23rd - 31st May - TWASI Annual Exhibition at Nature in Art, Gloucester. 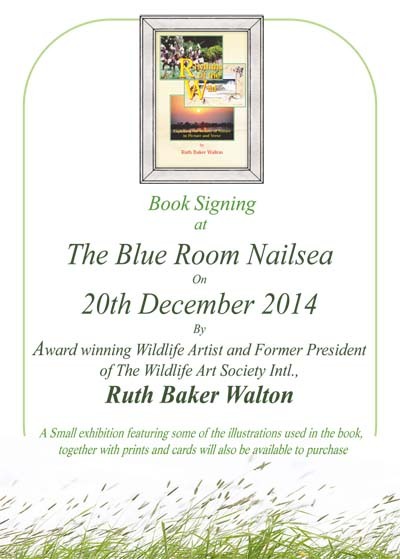 December - On the 20th December, Ruth Baker Walton will be holding a book signing at The Blue Room, Crown Glass Centre, Nailsea, Somerset. The 'Forward' has been written by John Sparks, former BBC Wildlife Producer and the book contains 30 nature inspired poems all illustrated by my paintings and/or photographs. 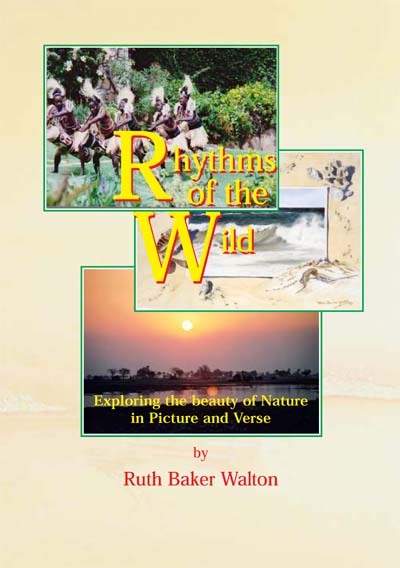 'Rhythms of the Wild' will be available for purchase direct from me at a cost of £9.95 plus postage from November. Please quote ISBN 978-1-901098-6 on ordering. 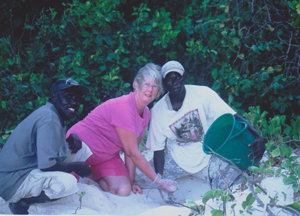 May - TWASI Annual Exhibition- Ruth will be exhibiting four new paintings at this exhibition. August/September - Reference trip to Botswana and Namibia. Further events will be listed when available. During the month of December 2013 I shall have an exhibition of some 30 paintings at The Coach House Gallery, Guernsey, C.I. The exhibition will feature new works and also 3 award winning paintings. The Preview is on Sunday 1st December when I will be in attendance talk about my travels and the inspiration for my work. 2nd-10th June 2012 The Wildlife Art Society Annual Exhibition at Nature in Art, Gloucester. 30th April - 8th May North Somerset Arts Week at The Heron Gallery, 98 Drove Road, Weston super Mare. 27th May - 5th June The Wildlife Art Society Intl., Annual Exhibition at Nature in Art, Twigworth, Gloucester. The Wildlife Art Society International Annual Exhibition 29th May - 6th June 2010 at Nature in Art, Twigworth, Gloucester. I shall have four new paintings exhibited that will be entered for the prestigious Christopher Parsons Award which I was fortunate to win in 2008. 1) Reflections of the Okavango - a typical Delta landscape 2) Okavango Sunrise - Red Lechwe running through water in the misty light of sunrise. 3) A Study in Black & White - a new modern slant on a zebra portrait. 4) Midday Thirst - zebra at a waterhole, again with a modern slant on the composition. For invitations to the Preview on Friday, 28th May from 7-9pm please contact me direct. October Solo exhibition at the Weston Super Mare Museum & Art Gallery opened by John Sparks BBC Film Producer.